My mother is the epitome of Country Love. Her fragrance is mountain pine, crunchy apple, and wild rose, all mixed together. with a wood stove for heat and cooking. She was sparkling and vivacious as the head cheerleader every year in high school. or gathering wood for the fire. She looks so young that she and I are usually assumed to be sisters. But the most remarkable thing about her is her unconditional love. All my growing-up years we had an “extra” person living with us. but there were many others before the pregnant teen when I moved out. She cared for them all. regardless of whether their behavior was wonderful, or callous and vindictive. 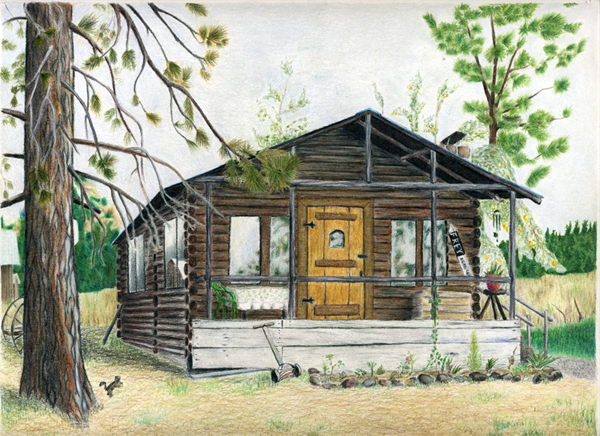 Drawing is of the log cabin built by her grandfather when her father was toddler. Pencil drawing by my son, Brad Davis. My mother, JackieAnn continues to have the motto “why walk when you can RUN”. She turns 79 this year, got some horses in past few years, and is currently tent camping with husband and horses. If i can get her to stand still long enough (in just the right place so there is cell reception) I will wish her Happy Mother’s Day.